The history of Story Magazine, the popular literary or “little” magazine, gives a clear picture of the struggles of this entire class of publications. Story, certainly one of the, if not the, most popular of little magazines in the twentieth century opened and closed shop a fair amount of times throughout its history before finally ceasing publication for good in 2000. Story Magazine is a personal favorite of mine, because I had subscribed to it myself for three or four years in the early 1990’s, when I was doing a lot of writing myself. While I sell the vintage issues, every time that I come across one, and especially now as I write this, I find myself longing to search the attic for my 10-15 year old copies that were read from cover to cover. Story Magazine’s history is as simple to write as it is complicated in its existence. My notes are cribbed from the Antique Trader Vintage Magazines Price Guide (also used below in determining value), which seemed to heavily rely on either the Archives of Story Magazine and Story Press web page or the Writer’s Digest article, “What’s STORY Magazine? A Brief History”, which that site credits. Story Magazine was founded by Whit Burnett and his first wife, Martha Foley, in Vienna, from where Volume 1, Number 1 dated April/May 1931 was published on an old mimeograph machine. The following year Story was printed in Palma, Majorca before settling in New York City in 1933. That first issue from Vienna had a circulation of just 167 copies, a number which certainly plants the thought of acquiring a copy in the back of my head. Subsequent circulation numbers are not reported for the first few years, but the project must have gone well since Burnett founded The Story Press in 1936. By 1940 we do have a number, Story Magazine then boasted a circulation of 20,000 copies. Story by this time published literary giants such as William Faulkner, William Saroyan, Erskine Caldwell, Thomas Mann, Sherwood Anderson and several others. It’s biggest coup, and certainly the most valuable issue of Story Magazine, was the very first publication of J.D. Salinger with his story “The Young Folks” in the March/April 1940 issue. Hallie Southgate Burnett, Whit’s second wife, became co-editor in 1942. Due to causes I did not come across, but will have a guess at, Story Magazine ceased publication in 1948 due to financial concerns. My guess isn’t very daring, I assume that there was a lull in circulation during and immediately after World War II. Story Magazine was then published by The Story Press in book form from 1951-1953 before once again suspending publication. Burnett brought it back in 1960, and then it was acquired by Scholastic Press in 1966 before the Burnetts once again suspended publication a year later. This was Whit Burnett’s last go around with Story. Burnett lived from 1899-1973. 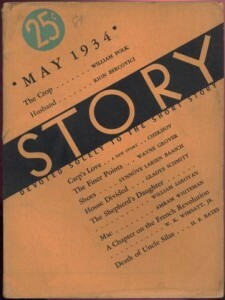 Story Magazine laid dormant until 1989 when it was relaunched as a quarterly by Publisher Richard Rosenthal and his wife and Editor, Lois Rosenthal. These were the issues that I read, and they were always finished well in advance of the next issue. I remember looking for Story at Manhattan newsstands a few years ago and being very disappointed at finding just about every other little magazine I had heard of and, of course, several that surely came and went with maybe a few sticking around, but no Story. It wasn’t until I became active in selling magazines that I learned the final issue of Story Magazine was Winter 2000. Go here to read the start to finish story of acquiring and selling several choice early issues of Story Magazine from the 1930’s and 40’s.